China carried out a long-range missile flight test on Saturday using multiple, independently targetable reentry vehicles, or MIRVs, according to U.S. defense officials. The flight test Saturday of a new DF-41 missile, China’s longest-range intercontinental ballistic missile, marks the first test of multiple warhead capabilities for China, officials told the Washington Free Beacon. China has been known to be developing multiple-warhead technology, which it obtained from the United States illegally in the 1990s. However, the Dec. 13 DF-41 flight test, using an unknown number of inert maneuvering warheads, is being viewed by U.S. intelligence agencies as a significant advance for China’s strategic nuclear forces and part of a build-up that is likely to affect the strategic balance of forces. China’s nuclear arsenal is estimated to include around 240 very large warheads. That number is expected to increase sharply as the Chinese deploy new multiple-warhead missiles. The current deployed U.S. strategic warhead arsenal includes 1,642 warheads. All 450 Minuteman III missiles have been modified to no longer carry MIRVs. However, Trident II submarine-launched missiles can carry up to 14 MIRVs per missile. Additionally, the development of China’s multiple warhead technology was assisted by illegal transfers of technology from U.S. companies during the Clinton administration, according to documents and officials familiar with the issue. Details of the flight test and the number of dummy warheads used during it could not be learned. However, the DF-41 has been assessed by the National Air and Space Intelligence Center (NASIC), the intelligence community’s primary missile spy center, as capable of carrying up to 10 warheads. Pentagon spokesman Lt. Col. Jeff Pool declined to comment on the DF-41 test. "We encourage greater PRC transparency regarding their defense investments and objectives to avoid miscalculation," Pool said in response to questions about the Chinese missile launch. China’s government has made no mention of the test, which was carried out at an unknown missile test facility. Past tests of the DF-41 have been carried out at the Wuzhai Missile and Space Testing facility, located about 250 miles southwest of Beijing. A report made public earlier this month by a congressional China commission stated that the DF-41 will be able to carry up to 10 warheads and is expected to be deployed next year. "The DF-41, which could be deployed as early as 2015, may carry up to 10 MIRVs, and have a maximum range as far as 7,456 miles, allowing it to target the entire continental United States," the report said. "In addition, some sources claim China has modified the DF–5 and the DF–31A to be able to carry MIRVs." China also conducted a flight test in late September of another long-range missile, called the DF-31B that also could be outfitted to carry MIRVs. "China could use MIRVs to deliver nuclear warheads on major U.S. cities and military facilities as a means of overwhelming U.S. ballistic missile defenses," the report by the U.S.-China Economic and Security Review Commission said. NASIC intelligence analyst Lee Fuell told the commission that China’s mobile MIRV-modified missiles provide greater targeting with fewer missiles and allow for a larger reserve of missiles during a conflict. "China is likely to employ a blend of these three as MIRVs become available, simultaneously increasing their ability to engage desired targets while holding a greater number of weapons in reserve," Fuell was quoted as saying in the report. A classified NASIC report dated Dec. 10, 1996 stated that China developed a "smart dispenser" for launching multiple satellites using technology developed under a contract with Motorola to launch Iridium communications satellites. The technology transfer was approved by the administration of President Bill Clinton. "An initial NAIC study determined that a minimally-modified [smart dispenser] stage could be used on a ballistic missile as a multiple-reentry vehicle post-boost vehicle" that could be used for multiple warheads "with relatively minor changes." The U.S. data was provided to China’s state-run Great Wall Industries, a missile manufacturer, through a Hong Kong company called Asiasat and used in systems called expendable perigee kick motors—a key element used in MIRV guidance. The kick motors are used to position a multiple warhead "bus" or stage as part of the targeting process. The transfers were made under loosened export controls by the Clinton administration beginning in 1993. Larry Wortzel, a former military intelligence official who specialized on China, said the Chinese military has been working on a MIRV-modified DF-41 for a number of years. Wortzel said Chinese military research literature has documented work on the DF-41 but the Pentagon "has been reluctant to discuss or confirm these developments." "The United States is now threatened with a more deadly and survivable nuclear force that makes our weak ballistic missile defenses less effective," Wortzel said. "We need to improve our own defenses and modernize our own deterrent force as the Chinese are doing." Rick Fisher, a specialist on the Chinese military, said the advent of China’s MIRV capability should mark the end of U.S. efforts to reduce the number of nuclear warheads. "The Chinese have not and likely will not disclose their nuclear warhead buildup plans, Russia is modernizing its nuclear forces across the board and violating the INF treaty with new classes of missiles, so it would be suicidal for the Washington to pursue a new round of nuclear reductions as is this administration’s preference." Fisher, with the International Assessment and Strategy Center, said China may deploy a combination of single-warhead and multiple warhead DF-41s, with the single warhead version carrying a huge "city buster" multi-megaton bombs. "The beginning of China's move toward multiple warhead-armed nuclear missiles is proof that today, arms control is failing to increase the security of Americans," Fisher said. "Instead, it is time to be rebuilding U.S. nuclear warfighting capabilities, to include new mobile ICBMs, new medium range missiles and new tactical nuclear missile systems." Georgetown University Professor Phillip Karber has studied China’s nuclear forces and believes its arsenal is far larger than the U.S. intelligence estimate of 240. "The Chinese development of the DF-41 has been a long term, methodical process," Karber said. "However, if as we suspect they are going to put a MIRVed version of the missile on both rail and road-mobile launchers, the number of reentry vehicles could grow quite rapidly depending on the number of warheads they end up putting on the missiles." The DF-41 was revealed inadvertently by the Chinese government last summer when details, including the fact that it will be a multi-warhead missile, appeared on a provincial government website before being quickly censored and removed. 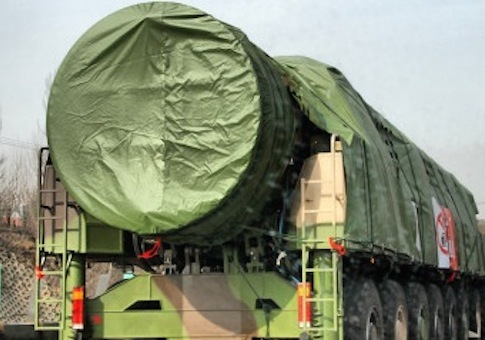 The Shaanxi provincial government announced June 13 in a progress report on its Environmental Monitoring Center Station that the DF-41 missile was among its projects. "On-site monitoring for Phase Two of the project’s final environmental assessment and approval of support conditions for the development of the DF-41 strategic missile by the 43rd Institute of the 4th Academy of Aviation Industry Corporation of China (AVIC) was initiated," the notice said. AVIC is China’s state-owned aerospace and defense conglomerate. A state-run Global Times report, also later censored and taken offline, quoted a Chinese expert as saying the missile will carry multiple warheads. After several years of silence on the DF-41, the Pentagon disclosed the existence of the new missile in its latest annual report on the Chinese military, made public in June. "China also is developing a new road-mobile ICBM known as the Dong Feng-41 (DF-41), possibly capable of carrying multiple independently targetable re-entry vehicles (MIRV)," the report says.